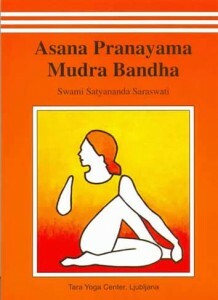 Are you familiar with the best hatha yoga practise - Surya Namaskara? Are you familiar with the best hatha yoga practise – Surya Namaskara? 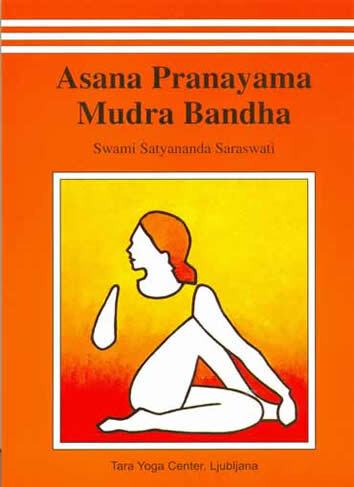 Disclaimer: This article is written from the teachings of Paramahamsa Satyananda Saraswati and the below content comes directly from his book “Asana Pranayama Mudra Bandha“. 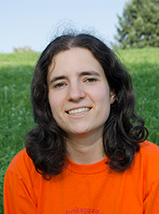 Parts of the article are adopted, others are directly taken. Surya (in Sanskrit, sun) and namaskara (salutations) is a yogic practice considered to be the king among all other yoga asanas. The sun symbolizes spiritual consciousness and in ancient times was worshipped on a daily basis. In yoga the sun is represented by pingala or surya nadi, the pranic channel which carries the vital, life-giving force.The practice consists of 12 different asanas and each of them could be practiced separately. General benefits: Surya namaskara vitalizes the whole body, balances and stimulates all the body systems and glands. It’s used for healing patients with HIV, cancer and other physical or psychological disorders. Surya namaskara can be practised both with the eyes open or closed. 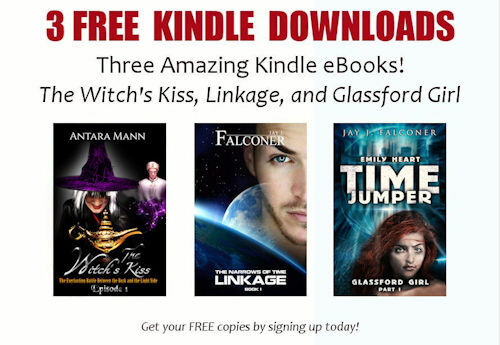 With closed eyes the effect is more internal. For instance, I prefer to practice surya namskara with my eyes open to keep my mind more extrovert. However sometimes I perform it with my eyes closed. Contra indications: Carefully observe the contraindications for the seven component postures and ensure that they can be performed comfortably. The practice of surya namaskara should be immediately discontinued if a fever, acute inflammation, boils or rashes occur due to excess toxins in the body. When the toxins have been eliminated, the practice may be resumed. People suffering from high blood pressure, coronary artery diseases, or those who have had a stroke should not practice surya namaskara. Also in cases of hernia or intestinal tuberculosis it should be avoided. During the onset of menstruation, this practice should be avoided. Towards the end of the period, the practice can be resumed. During pregnancy, it may be practised with care until the beginning of the 12th week. Following childbirth, it may be commenced approximately forty days after delivery for re-toning. Time of practice: The ideal time for surya namaskara is at sunrise, the most peaceful time of the day, or at sunset. Of course it can be practised at any other time. When I was in the ashram, when we were performing surya namaskara our yoga teacher advised us to take off our socks. I still have no idea why. When I asked him why, he smiled and replied “You can practise it with socks too”. However, my question remained unanswered. The palms are placed together in the front of the chest in namaskara mudra. 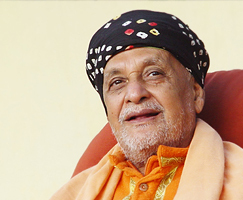 The whole body is relaxed and you mentally pay homage to the sun – the source of all life. 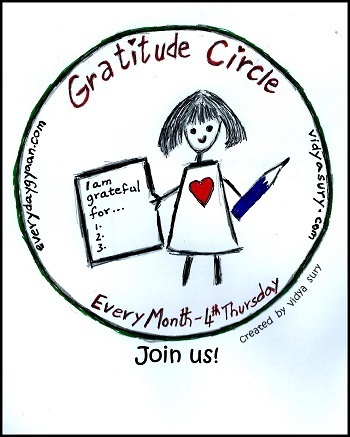 Breathing is normal and the awareness can be directed to the chest area or anahata chakra. Inhale while raising the arms and direct the awareness on vishudhi chakra (the troat area). Both arms are separeted and stretched above the head. The head, arms and upper trunk is slightly bent. Exhale and bend forward so that the fingers of your hands or palms touch the floor on either side of the feet. Try to keep the knees straight. The awareness is on swadishtana chakra in the region of the groins. Contra-indications: People with back conditions should not bend fully. Bend only as far as it is comfortable. Inhale while stretching either the right or left leg back and place both hands on the floor beside the feet. If you stretch the right leg back, the pace should be moderate. If you start with the left leg, you can speed up. 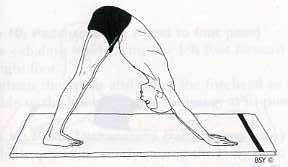 With the left leg back the effect of the asana is more physical, while with the right leg back it’s more psychological. Bend the other knee, keep the arms straight, arch the back and title the head backward. The inner gaze is directed upward to the eyebrow center and awareness is on ajna chakra (in front of the eyebrow center). Keep the hands and right foot still, and take the front foot back beside the other one. Simultaneously, raise the buttocks and lower the head between the arms so that the back and legs form two sides of a triangle. Straighten the legs and arms in the final position and try the heels to come down towards the floor. Do not strain. The awareness is on vishudhi chakra. Contra indications: as for padahastasana. 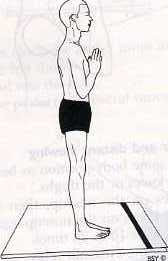 Keep the hands and feet in place and lower the knees, chest and chin to the floor; the feet will come up on to the toes. The abdomen, buttocks and hips should be raised while the knees, chest and chin touch the floor simultaneously. If this is not possible, first lower the knees, then the chest, and finally the chin. The awareness is on manipura chakra. 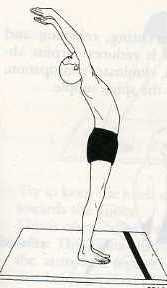 Contra-indications: people with serious back problems, high blood pressure or heart conditions should not do this asana. Hands and feet are in place and slide the chest forward. Raise first the head, the shoulders, then, straightening the elbows, arch the back into cobra pose. Thus, the buttocks and hips will lower on the floor. Bend the head back and direct the gaze upward to the eyebrow center. The awareness is on swadishtana chakra. Contra-indications: Not advised for people suffering from peptic ulcer, hernia, intestinal tuberculosis or hyperthyroidism. 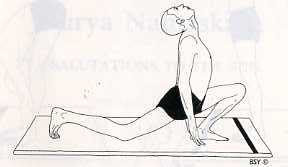 From bhujangasana assume parvatasana. Exhale while raising the buttocks. The awareness is as for position five. Keep the palms flat on the floor and the right foot in place. Bend the left leg and bring the left foot forward between the hands. Simultaneously, lower the right knee so that it touches the floor and push the pelvis forward. Bring the right foot forward next to the left foot. Straighten both legs. Bring the forehead as close to the knees as possible without straining. Exhale while performing the movement. The awareness is as for position three. Keep the arms and spine in a straight line. Raise the torso and stretch the arms above the head. Keep the arms separated, shoulder width apart. Bend the head, arms and upper trunk backward slightly. Inhale while straightening the body. The awareness is as for position two. Exhale while bringing the palms together in front of the chest. The awareness is as for position one. • In position 16, instead of stretching the right foot backward, stretch the left foot back. • In position 21, bend the right leg and bring the right foot between the hands. On the completion of each half round, lower the arms to the side, relax the body and concentrate on the breath until it returns to normal. For emotional tension, after completing surya namaskara, practice antar mauna (observing one’s thoughts sitting in lotus posture). Otherwise one can lie on the floor in shavasana (corpse pose) and relax the whole body. Duration: For spiritual benefits practice 3 to 12 rounds slowly, while for physical benefits the same amount more quickly. Beginners can start with smaller number, while advanced students can increase the number. Under the guidance of an adept teacher, one can practise surya namaskara with mantras or beeja mantras.